EspañolA passion for marijuana gripped the heart of the Argentinean capital on Saturday, May 2, as over 100,000 people marched through the streets of Buenos Aires to demand legalization and the right to personal cultivation of the drug. The demonstration marshaled around 150,000 people, the same number as in 2014, and was part of the Global Marijuana March (GMM) simultaneously celebrated in over 849 cities and 76 countries since 1999. “We’re asking for the legalization and regularization of all cannabis, for all its uses: medical, industrial, and recreational,” Nicolás Breg, representative of the Association of Argentinean Cannabis Agriculturalists (AACA), told the PanAm Post. The capital’s Plaza de Mayo — the location of some of the most iconic moments in Argentinean history — rapidly became a fair of all things cannabis, where entrepreneurs walked the crowds and set up stands to sell shirts, books, smoking paraphernalia, handicrafts, and food: with and without cannabis. A brisk trade in “magic” brownies that supposedly contained cannabis competed with organic food products, sandwiches, hamburgers, and the Argentinean hot dog choripán. But the festive climate was tempered with a dose of activism, as the protesters installed in tents at one end of the plaza shared varied messages and information according to their group affiliation. “No more prisoners for cultivating cannabis. Self-cultivation now!” read one AACA pamphlet, emphasizing the pain-killing and bronchodilator properties of the psychoactive. “There’s no genuine fight against narco-trafficking or insecurity if it doesn’t begin by recognizing the complicity of security forces,” said another leaflet handed out by members of the Socialist Left party. Despite the marijuana smoke that filled the porteño air, the federal police limited themselves to diverting traffic away from the streets. The crowds began to mobilize along the picturesque Avenida de Mayo with the national Congress as the initial destination. Here, organizers erected a stage and several individuals spoke, including Gonzalo: an activist who told the crowd about how his medical use of marijuana helped to mitigate his illness. Police looked the other way as protesters lit up, as if the consumption of marijuana had been legalized in the country. 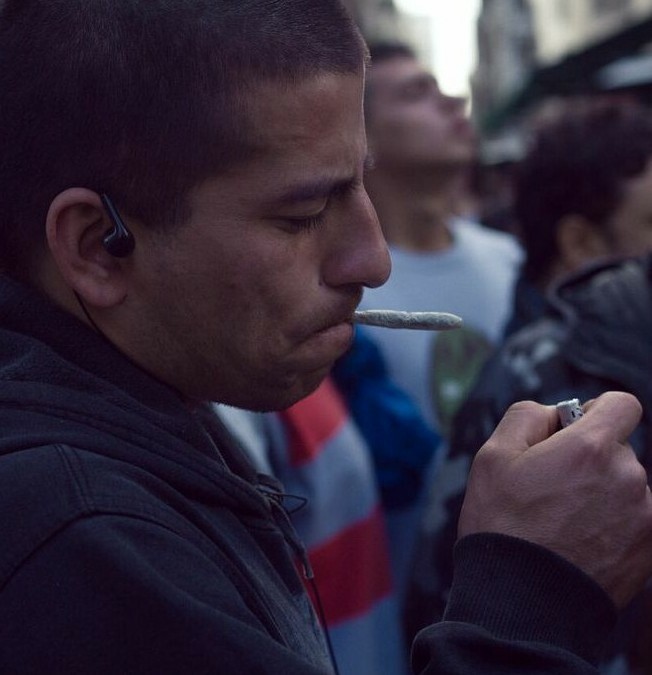 Argentina’s drugs law, in force since 1989, punishes “basic possession” of marijuana with a penalty of one to six years in prison, or one to two years if a judge determines that the herb is for personal consumption. “Sadly society isn’t going to permit it, if it’s not regularized by the government,” she predicted, referring to the process of legalization in Uruguay, where the state is set to assume a central role in the production and distribution of the drug. The experience of Uruguay seems to have changed the opposition of many pro-legalization activists towards commercialization of the drug. “Permitting sale means entering the capitalist system,” one activist said in 2011. “The change propelled by Uruguay has brought this issue to the forefront in Latin America, the same as Chile which is doing it from the medicinal point of view,” said Breg, explaining that medical needs were driving a change, and that responsible adults were capable of deciding what is and isn’t beneficial for their health. Organizers nevertheless weren’t optimistic about a possible legalization in the short term. “We expect to continue with this fight; for now, no political party in this election year has taken a clear position about cannabis legalization,” he added. The three principal candidates in October’s presidential elections haven’t suggested any drug reforms, and all have come out in favor of escalating the fight against narco-trafficking. “They assume a lot, but they barely discuss the issue, and do even less,” Breg concluded, while the final speakers finished addressing the crowd outside Congress. The mobilization in Buenos Aires was replicated in other cities in Argentina, as well as in Bolivia, Brazil, Chile, Colombia, Ecuador, Mexico, Peru, Paraguay, Uruguay, and in multiple cities in Canada and the United States, as well as in Europe. The GMM was also celebrated in India, Israel, and Japan, while South Africans also came out in force in favor of cannabis legalization. In Guayaquil, Ecuador, over 200 people congregated in the port city’s Kennedy Park to join the global initiative for the first time. “The war against drugs is a lost war, and it’s unfair that they imprison people only for consuming, planting, or being in possession of marijuana,” Milica Pandžić, a member of Students For Liberty’s executive council, told the PanAm Post.